Neuchâtel Junior College was founded with the vision of offering exclusively the pre-university year, and to this day, it is the only school of its kind that we know of in the world. Our 100-percent university-bound community gives rise to a particular energy and focus about the future. Enrollment at the Junior College is intentionally small, enabling staff and faculty to attend to students’ university placement needs with attention and care. NJC provides the support, guidance and assistance that students need to finalize their choices, facilitate their applications and gain admission to university programs across Canada and all over the world. We do recommend that students visit a few top choice university campuses prior to their departure for Neuchâtel, but other than this, we are easily able to execute every other aspect of the university application process from Switzerland. Many factors are at play to ensure that students have the university placement advice and support that they require – the foundation of which is NJC’s structured University Placement Program. Attention to detail at each integral phase ensures that the university placement process is seamless. Students benefit from ongoing counselling from NJC’s experienced Director of University Guidance and her dedicated guidance support team. The process commences with course selection advice in the spring prior to departure followed by one-on-one consultations, presentations and group meetings while in Switzerland. 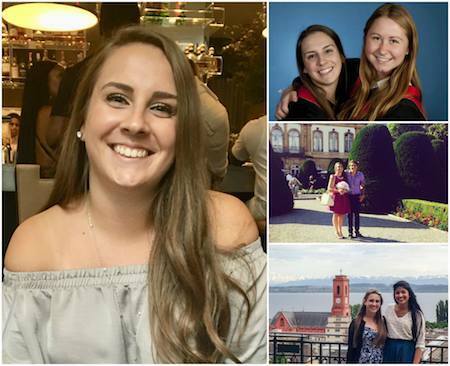 Ms. Adriaanse’s national and international experiences bring a diverse educational leadership direction to the Neuchâtel setting, and her talent and passion for Guidance and University Placement make her perfectly suited for her roles at NJC. Ms. Adriaanse feels privileged to play a role at this critical stage for NJC students who are making plans for their post-secondary destinations and futures. Her guiding principle is to use her expertise to assist students in making university decisions that are best suited to their talents and interests—all while inspiring them to consider new possibilities. She is also committed to keeping communication lines open between students, families and NJC as the exciting university placement process unfolds. Click here to view Ms. Adriaanse’s full profile. NJC’s campus is an official site for the SAT test. The SAT is owned, published, and developed by the College Board, a nonprofit organization in the United States. First introduced in 1926, the test is intended to assess a student’s readiness for university. Taking the SAT is required for freshman entry to many, but not all, universities in the United States. SAT consists of three major sections: Critical Reading, Mathematics, and Writing. NJC assists students preparing to sit the SAT test, and acts as a designated Test Centre. For more information about SAT testing at NJC, please contact the admission office. Students who wish to take the ACT—as part of their university placement plan—will travel to nearby Geneva to sit for the ACT at one of NJC’s fellow SGIS member schools. The ACT is the leading US college admissions test measuring what you learn in high school to determine your academic readiness for college. NJC’s campus is an official site for AP testing. Through Advanced Placement (AP) study, you can earn university credit and advanced placement, and even stand out in the admission process. AP study can help you acquire additional skills and habits you’ll need to be successful in university. Universities in more than 60 countries—including Canada and the US—award students credit, advanced placement or both on the basis of AP Exam scores. At NJC, we view AP as a natural extension of our strong tradition of university prep and placement. AP can be of interest to our Grade 12 students as well as to those who join us for a Gap Year of enrichment following completion of Grade 12 at home. The College Board, a non-profit organization in the United States, designs the AP program in conjunction with high schools, colleges and universities. AP examinations are written in May of each year. After the examinations, students submit their grades to universities and may qualify for university credit for advanced placement. For more information about Advanced Placement at NJC, please contact the Director of Admission. For more information on AP, visit the College Board’s website. 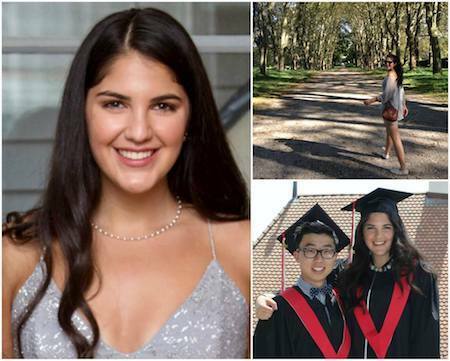 After graduating from NJC in 2014, Samantha Stuart headed to the University of Toronto on a full academic scholarship to study Materials Science & Engineering, with a minor in Bioengineering. She has spent the past 12 months working as a Quality Engineering intern at Synaptive Medical in Toronto, helping to develop robotic and software system to assist in neurological procedures. Recently, Samantha was also a speaker at TedX Collingwood, where she spoke about “The ‘E’ Word: Why Engineering Needs All of Us”. Highlights of Samantha’s year at NJC were her extracurricular experiences - she brought home the gold medal for Oral Interpretation at NESDA in Berlin and participated in MUN in St. Petersburg. She says that NJC is so much more than just a year abroad - it was an experience that helped her develop her character and will have an impact on her career and personal life forever. Samantha credits NJC for helping her become more open to new and scary-sounding opportunities outside of her comfort zone. Samantha has been nominated for an international research exchange project at the University of Liverpool in the UK this summer and when she finishes her studies, she hopes to pursue a Masters in Biomedical Engineering and then continue to work in the field of R&D engineering. After graduating from NJC, Charlie travelled to the Indian Himalaya on a mountaineering expedition with the National Outdoor Leadership School (NOLS) and then moved to Hokkaido, Japan, where he worked for Black Diamond Lodge & Tours and Hokkaido Backcountry Club. Charlie currently lives in Revelstoke, British Columbia. He is a professional member of the Canadian Avalanche Association and the Association of Canadian Mountain Guides (ACMG). While completing an Adventure Guide diploma, with a focus on backcountry ski guiding and mountaineering, at Thompson Rivers University in Kamloops, Charlie is working at Revelstoke Mountain Resort as part of the ski patrol team. He says that NJC instilled in him a strong ability to self-reflect, which has helped him make his own path by learning what he truly loves to do and what he wants to achieve in his life. As an avid skier, Charlie’s most treasured memory from his time at NJC was skiing around Grindelwald - a classic Swiss village whose authenticity and beautiful peaks blew him away. Charlie’s favourite part of day-to-day Swiss life was exploring areas in Neuchâtel and wandering through some of the local trails and hills with friends. He also enjoyed the food in Switzerland and living in Cortaillod with Mme Kohler, who would joke that she cooked Italian recipes with French ingredients in German sized portions! 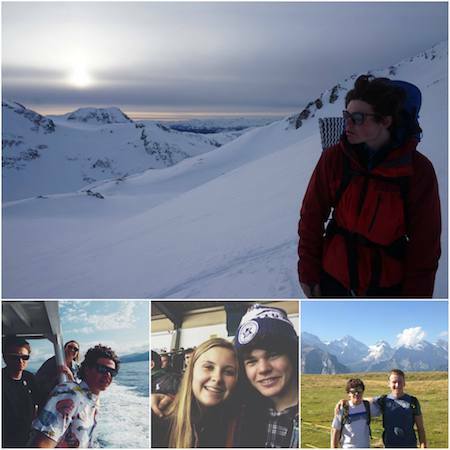 In the future, Charlie would like to continue working in the outdoor adventure tourism industry and also, become an ACMG ski guide - an arduous process that he is currently undertaking alongside his other professional and educational endeavours. Sarah graduated from Trinity College at the University of Toronto with an Honours Bachelor of Science, double majoring in Psychology and Ethics, Society & Law. While at NJC, Sarah lived with two housemates who became her best friends and the three of them loved living with the Grecuccios in Peseux. They even had a fully operational pizzeria in the basement! Sarah says she had never eaten so well in her life before moving in with her pension. She misses the small-town life in Neuchâtel and all of the wonderful and inspiring people that she met during her year at NJC. Sarah credits NJC for helping her build a foundation of self-confidence, ambition and determination. She is grateful for this life-changing experience that has helped her realize that the only thing standing between her and the future that she wants is hard work and perseverance. This coming September, Sarah will be attending law school at Queen’s University. Jerry Li will graduate a dual major in Government and Economics, with a sequence in Gender and Sexuality Studies from Claremont McKenna College in California. 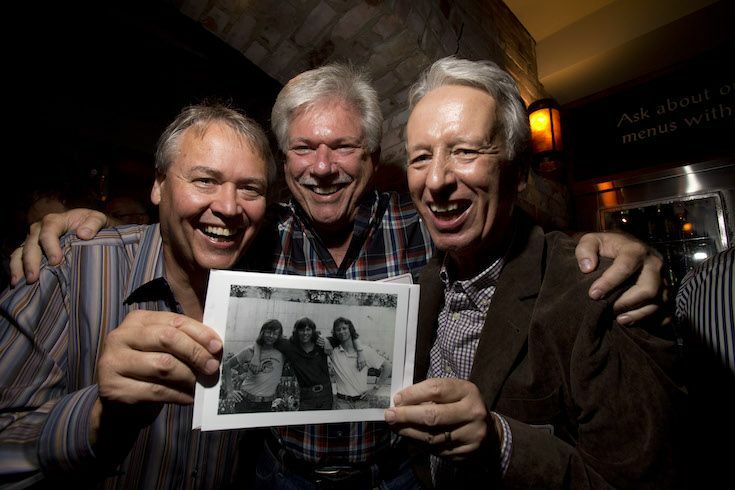 Jerry credits NJC for equipping him with a sense of adventure, and says that one of his favourite things about day-to-day Swiss life was the reliable transportation system, which allowed him to be spontaneous and adventurous. 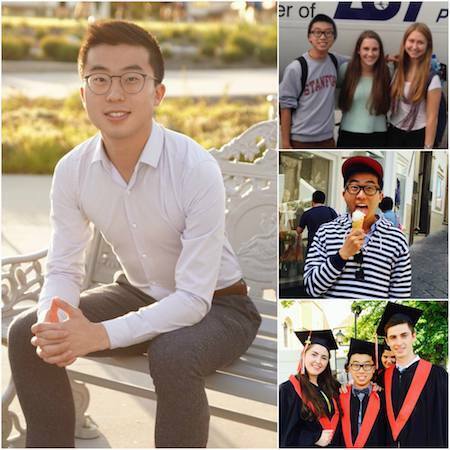 Since his time at NJC, Jerry has served as a Political and Economic Affairs Intern at the U.S. State Department through the Consulate General of the United States of America in Toronto, as well as a Foreign Policy and Diplomacy Services Intern at the Consulate General of Canada in Seattle. His passion for Model United Nations remains strong, after participating in BERMUN in Berlin and NEVSKYMUN in St. Petersburg at NJC. He has continued to compete at conferences at the university-level and moderated a committee at NHSMUN 2015 in NYC held at the UN Headquarters. Jerry is an incoming Associate Management Consultant at Bain & Company’s San Francisco office, and plans to pursue a Masters in International Migration and Public Policy at the London School of Economics. Eden completed her undergraduate degree in Psychology at the University of St. Andrews in the UK. Her decision to attend university in Scotland was largely due to the international experience she gained during her year at NJC, which made her comfortable with stepping outside her comfort zone and exploring new things. The year at Neuchâtel Junior was not only an amazing educational experience, but also opened up the world to her. For Eden, the best parts of day-to-day life in Switzerland were the cheese, the chocolate and seeing 72 of the greatest people she knows every single day at school. Her entire year is a treasured memory, especially the opportunities to travel with friends or just spend time with her classmates by the lake. Eden lived with the Cossentino family in Colombier and says that she will never forget how much fun she had exploring the village castle with her three housemates, and also, her Madame’s incredible lasagne! 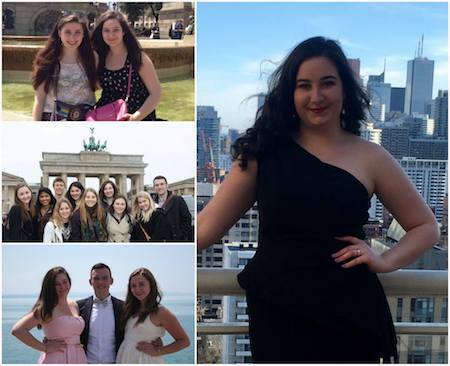 Eden will be starting her Masters degree in Social Work at Yeshiva University in New York this June. Brogan graduated from the University of Oxford with a BA Jurisprudence (Law and European Law Studies). He lived with the Ferrantis in Colombier and says that they treated him and his three housemates like sons. Brogan fondly remembers the lively dinner conversations, and how comfortable and supported he felt, not only with his pension family, but with the NJC staff, students and community. He credits his time in Switzerland for opening his mind to other people, and their perspectives and ways of life. One of his favourite parts of Swiss life and culture was having Friday night fondues on a terrace and people watching - a picturesquely European experience! 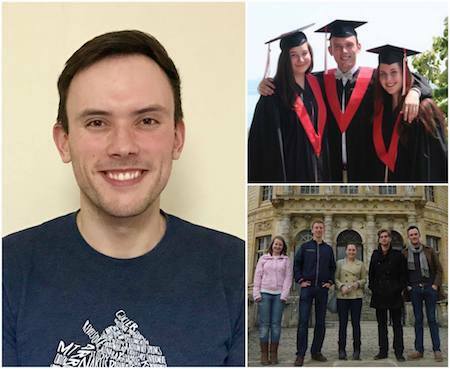 As a gap year student at NJC, Brogan says that he was able to cater his education to exactly what he needed to succeed at university. He says that the courses he followed at NJC inspired him to take courses on international trade, carriage of goods by sea and taxation law at Oxford. Brogan will be attending the University of British Columbia this September and pursuing a Masters in Law. 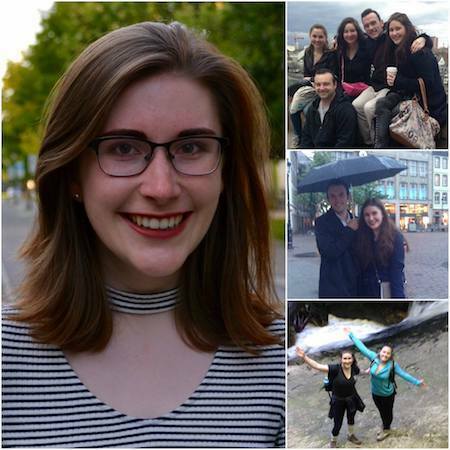 Carys specialized in Political Science at the University of Toronto. She says that her most treasured memories from her time at NJC were the simple, quiet times spent with friends. She loved having friends sleep over and having breakfast together on her pension's terrace overlooking the lake and the Alps. She loved having dinner and practicing her french with her pension family every evening, Mme Schlittler and M. Shirvani, and the freshly baked tresse au beurre that her pension Madame picked up every Sunday morning. The culture of punctuality in Switzerland meant that Carys was always on time - an aspect of Swiss day-to-day life that she loved and misses today, along with waking up the spectacular lake and mountain views, taking the bus every day with familiar faces and attending classes taught by who she describes as the smartest, funniest and most interesting teachers. NJC was completely unfamiliar territory for Carys and she is grateful today for the experience that forced her to figure out who she wanted to be and what path she wanted to take. She says that there is no place like NJC, where dozens of boys and girls are welcomed each September and bade goodbye as men and women in June. Carys has been working in the Minister of Energy’s office for the Ontario Government for the past three years and will be working on campaigns leading up to the election in June 2018. Carys is excited to further explore the political realm in the future. "Going into university, I feel as if I have an upper hand. I’m independent, mature, and confident in myself. I look forward to keeping on growing at university, in future travels and all endeavors."